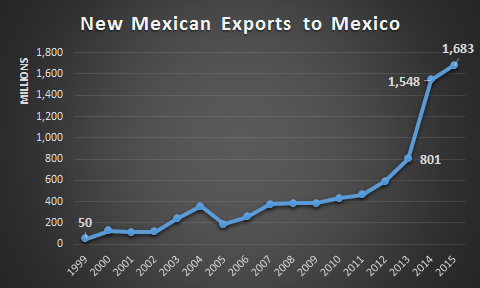 In 2014, New Mexico led the nation in export growth percentage (93 percent) to Mexico. Unfortunately, so often our state is at the top of lists in negative categories, so the expansion of trade with Mexico was a cause to celebrate. Last year, our trade with Mexico went up 9 percent, not as exciting as 2014, but compared to states such as Texas which saw their exports to Mexico decrease in 2015, a respectable showing. When I started my career in 1991, I remember that total annual New Mexico exports to our southern neighbor were approximately $30 million. Today, our state exports nearly $1.7 billion to Mexico. These exports have created thousands of good paying jobs, hundreds of millions of investment, and millions of dollars in state tax revenues. There is no doubt that trade, and particularly trade with Mexico, has been beneficial to New Mexico. I have stated since the beginning of my career that building a trade relationship with Mexico is the biggest economic development opportunity that our state has. As our exports to Mexico increase every year, this theory is becoming a reality.